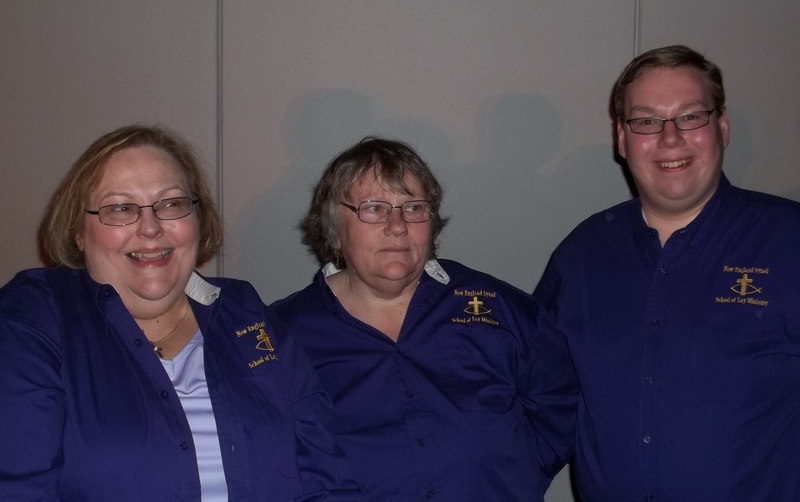 After two years of study, three members of Grace Lutheran Church West Springfield recently graduated from the New England Synod School of Lay Ministry. The graduates were Karen Blanchard, Carol Goulet and Ryan Lynch. The special graduation event and ceremony took place at the annual New England Synod Assembly of the ELCA, held at the Mass Mutual Center in Springfield June 3rd – June 5th. The School of Lay Ministry is an innovative program designed to give adult students an opportunity to grow in their faith for the purpose of personal spiritual development, biblical enrichment and life-long learning. This program seeks to assist those who have a desire to broaden their faith understanding and expand their skills for service in their local congregation. The first year of the two-year program included studies of the Old and New Testaments, and the second year of studies focused on theology, Lutheran Confessional Heritage and the American Religious Experience. The School of Lay Ministry, which is in it’s third year, had 33 graduates this year, the largest class ever. Congratulations to Ryan, Carol and Karen, and all of this year’s graduates. Click here to learn more about the New England Synod School of Lay Ministry. This entry was posted in Awards, News and Announcements and tagged School of Lay Ministry by Eric Parizo. Bookmark the permalink. Senior Analyst, Enterprise Security, with Current Analysis. For comments, questions or problems with the website, contact webmaster@gracelutheranonline.com.